Built her own steam locomotives, experimented with steam turbines and was the last class 1 railroad to operate steam. 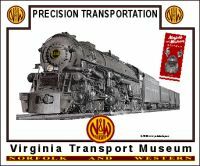 When in beautiful Roanoke VA, be sure to visit The O Winston Link Museum and the Virginia Transport Museum. Streamlined Norfolk & Western Rwy 600 series 4-8-4 steam locomotive, featuring Chief Powhatan with bow drawn and arrow heads leading the rails. Image is when she was owned and operated by the N&W Railway in 1950s. 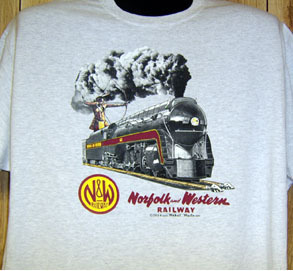 The Norfolk & Western Railways famous maroon and yellow logo on a premium light grey/ash tee. War time coal train on the Norfolk & Western Railroad. A classic railroad advertisement back when Americas Railroads handled 95% of all freight. 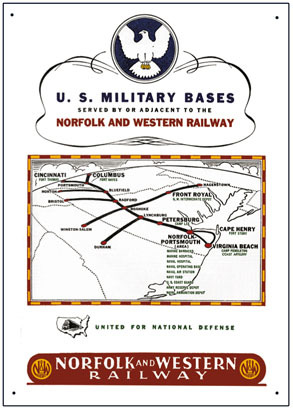 Reproduction of an ad ran by the Norfolk & Western Railway during the 1941 World War II build up of military bases on or near its line. A very interesting slice of American WWII history. 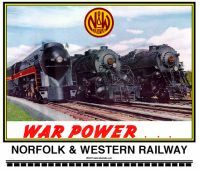 Reproduction & enhanced tin sign depicting the N&W RRs famous trio of War Power locomotives pulling for America in WWII. Class J, A & Y. A beautiful and informative tin sign of an historic railroad ad when America's railroads were on a war footing. One of the Norfolk & Western Railroads most famous locomotives, the Class A 2-6-6-4, home built in Roanoke between 1949 and 1950. No. 1218 is on display at the Virginia Transport Museum. 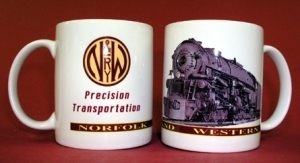 N&W 3-Steamers Coffee Mug featuring a Class A, Class J and Class Y6b all lined up in a publicity photo. This mug features the beautiful N&W 600 series 4-8-4 streamlined steam locomotive in a builders profile with mechanical specifications. The Norfolk & Western Railroads flagship passenger trains, Powhatan Arrow and Pocahontas, passing in the beautiful Virginia countryside. 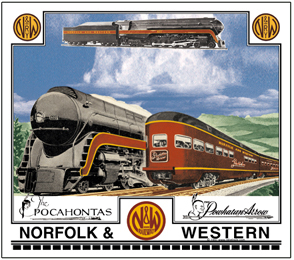 Plate features the classic N&W Railway Logo with images of Powhatan and Pocahontas, flagship passenger trains of the Norfolk & Western Railway. 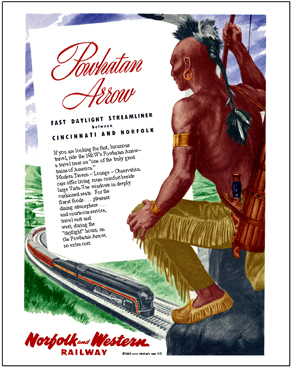 Plate features the N&W Railroads famous Powhatan Indian pulling his bow for the takeoff of the flagship Powhatan Arrow passenger train. 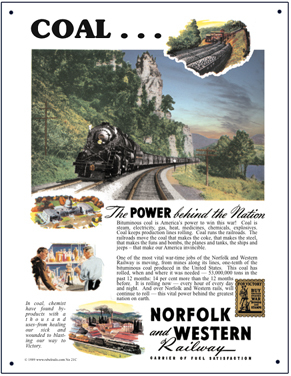 A classic image used by the N&W over many years promoting its fast passenger service. 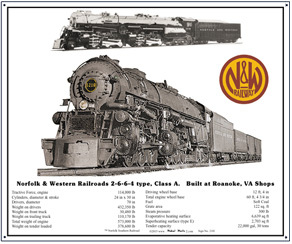 N&W 1218 Mouse Pad featuring the massive articulated steam locomotive seen romping throughout the South and Mid-West, now stored at the Virginian Museum of Transportation in Roanoke, VA. Mouse pad honoring the new Norfolk & Western Heritage diesel operated by the Norfolk Southern Railroad. 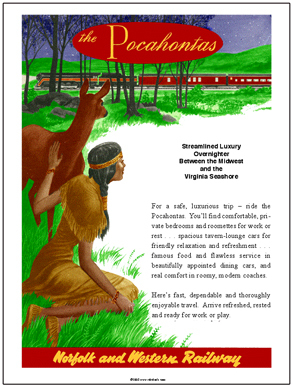 Pad features the N&Ws famous Pocahontas and Powhatan premier passenger trains passing in a mountain setting. Boy, those were the days. 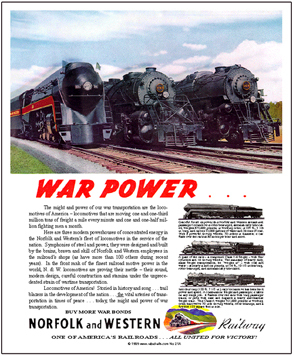 Pad features the N&Ws War Power pulling for America during WWII. Shown are an A-class, Y6b class and J-class. 6 inch x 6 inch square tin Blue logo sign used by the Norfolk & Western Railroad. 6 inch x 6 inch square tin sign of the Norfolk & Western Railways Cavalier passenger train. Norfolk & Western diesel joins Norfolk Southern Railroads Historic diesel fleet. 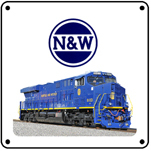 6 inch x 6 inch square tin sign of the historic Norfolk & Western Heritage diesel. A powerful locomotive paint scheme. 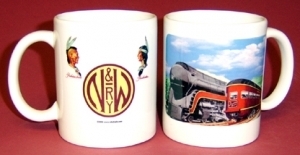 6 inch x 6 inch square tin images of Powhattan and Pocahontas used by the Norfolk & Western Railroad. 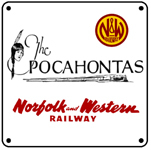 6 inch x 6 inch square tin sign of the N&W Railways Pocahontas Drumhead used on the rear of the passenger train. 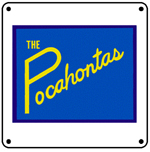 6 inch x 6 inch square tin sign of the N&W Railways Pocahontas script logo with train. 6 inch x 6 inch square tin Railway logo sign of the Norfolk & Western Railway. 6 inch x 6 inch square tin RWY logo sign of the Norfolk & Western RY. Informative 10in x 12in metal sign featuring the Norfolk & Western Railways steam No. 1218, with builders specifications. 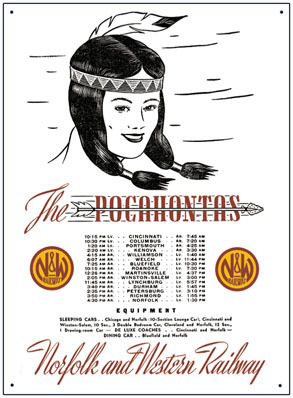 Reproduction of a 1941 advertisement ran by the Norfolk & Western Railway promoting its Pocahontas passenger train. 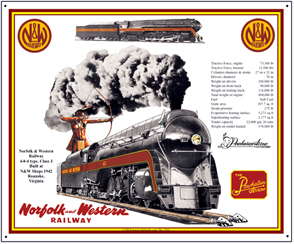 10in x 12in metal sign with images of the Norfolk & Western Railways beautifully streamlined 600 series 4-8-4 high speed passenger locomotive when she was owned and operated by the N&W. 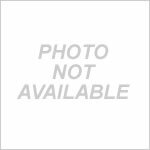 Includes builders specifications, Chief Powhatan and various logos. 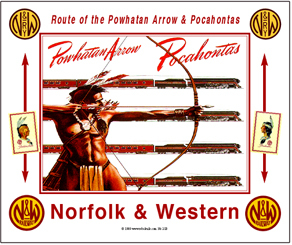 Reproduction & enhanced tin sign depicting the N&W RRs famous Powhatan Indian pulling his bow for the take off of the Powhatan Arrow and other flagship passenger trains. Reproduction and enhanced tin sign depicting the N&W RRs famous and beautiful Pocahontas watching her namesake train pass in the night. A truly unique sign of an historic American image. 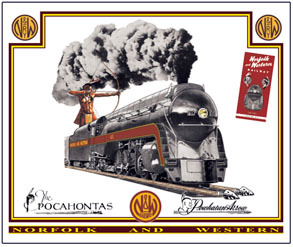 Reproduction tin sign featuring the Norfolk & Western Railroads flagship Powhatan passenger train with the fabled Indian Chief Powhatan looking on. A gorgeous tin sign.